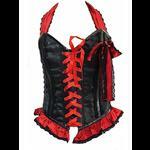 A stunning black satin burlesque corset with a ribbon halter neck, tying to a bow at the back. The lightly padded cups are trimmed with glittering black sequins and black sequins also cover the boned panels below. The corset has a front bust fastening with flat steel bones either side and a further 12 plastic bones throughout. The back of the corset has classic metal eyelet and black satin ribbon lacing with a modesty panel. Very glam.